Mar. 15, 2013 - Now That You're All Gassed Up...! Mar. 05, 2013 - Hey... Who Turned On the Lights? Stephens Automotive Sales offers expert service maintenance for your domestic or imported vehicle. Stephens Automotive Sales offer car tune-up services, a preventative maintenance service for your vehicle. Stephens Automotive is a proud leader in the sale of reliable, late model used cars, trucks, SUVs, vans, and hybrid vehicles. Stephens Automotive is a proud leader in the sale of reliable, late model used cars, trucks, SUVs, vans, and hybrid vehicles. 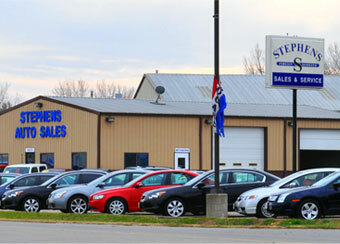 Stephens Automotive is conveniently located on Beaver Drive in Johnston just off of Merle Hay Road. For over 20 years, Stephens Automotive has been serving Des Moines and surrounding communities, including Ankeny, Clive, Grimes, Johnston, Urbandale, West Des Moines, and Windsor Heights. We carry a wide selection of pre-owned cars, trucks, SUVs Vans, and crossovers. We are waiting to serve you. Stop by Stephens Automotive dealership in Des Moines, Iowa and see for yourself. Contact us today for details about your next used or certified car purchase at (866) 600-0302 or email us. Visit us and drive off in your dream car today. Acura, Audi, BMW, Buick, Cadillac, Chevrolet, Chrysler, Dodge, Ford, GMC, Harley Davidson, Honda, Hyundai, Infiniti, Jaguar, Jeep, Kia, Land Rover, Lincoln, Lexus, Mazda, Mercedes-Benz, Mercury, Mini, Mitsubishi, Nissan, Oldsmobile, Pontiac, Saab, Subaru, Toyota, Volkswagen, Volvo, and more! After your purchase, we will continue to serve you. Stephens Automotive has a state-of-the-art service center so you don't have to worry about after-sales service on your late model imported car and other vehicles. Our team of ASE master technicians can handle any service or repair work, including but not limited to brakes, engines, electrical, and tune-ups. Need assistance in financing your vehicle purchase? No worries. We have helped hundreds of other buyers over the years and are eagerly ready to assist you as well.